finer wire than either the common wire or box nail. sizing. It reads two penny, three penny, and so on. finish nails where appearance is important. will hold better than many nails poorly placed. 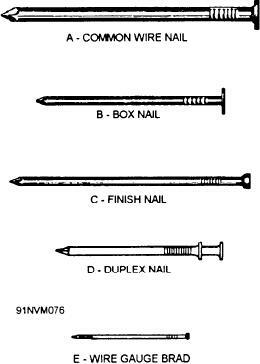 Nails are the cheapest and easiest fasteners to use. often necessary to meet specifications. s t e e l , stainless steel, aluminum, or brass. designed to be driven by a screwdriver.